However, most of the time I am with someone else who also is in good shape and we are not carrying much weight. A 7 mile hike in about 2-3 hours is quite doable, and I am 70 years old. But that brings up the question of how much weight could I carry and could I do it day after day, while sleeping on the ground and making camp with no nice soft lounge chair in which to recover? I’m not 100% sure I could do that. A young man in good shape normally walks around three miles an hour and can do it all day, on level ground, carrying little to no weight. But remember, the speed of the march is determined by the weakest member of the group, not the strongest. When bugging out, the weight of a pack is going to slow this young man down. Other factors that determine your speed are the weather, terrain, the condition of the trail, and what you are carrying. Do you have children or elderly people with you? Do any of your group have medical conditions that slows them down? Another factor that will affect your distance and speed is threats. Are you having to hide to avoid other people? Now I see some preparedness books that tell you that when bugging out your pack should weigh up to a third of your body weight. Now this may be a good guideline for a twenty year old in good shape, but it won’t work for the rest of us. One old friend of mine and an old special forces guy, says most people way overestimate their ability to walk in planning for bugging out. He feels that most family groups with children or elderly will travel closer to 3-5 miles a day when walking cross country. A lot will will depend on you and your families physical and emotional condition and don’t forget very good foot ware. Most family groups with young children or elderly would average closer to 5 miles a day. Young people in average shape should do 20 miles or so in good terrain for the first couple of days, then blisters, light rations and other problems will slow them down. So plan on your bug out taking longer then you expect if you are traveling by foot. This entry was posted in bugging out, Seventy-two hour kits and tagged backpack, bug out bag, bugging out, hiking, walking. Bookmark the permalink. 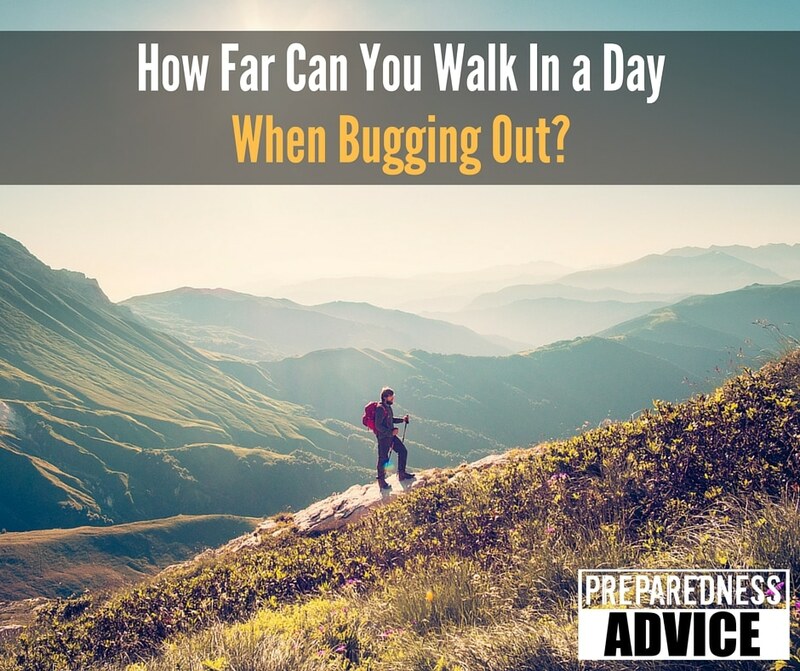 7 Responses to How Far Can You Walk In a Day When Bugging Out? Well, fitting into the old age and handicapped group, I carry a folding luggage cart in my truck with all the rest of my gear…. knowing that I could not carry but a small amount of what I keep in the truck. The cart will certainly carry more weight than I could carry even if I was in great shape and at a much younger age. People need to realize they should work on endurance right now, before disaster. First hike 1-2 miles on easy terrain (like city sidewalks) bringing only a bottle of water to see how you do. If you can do it easily then bring it up to 5 miles next time. If it was difficult then add a half mile at a time till you can do 5 easily. After you can do 5 miles a few times easily and at a noticeably quicker pace than the first time then add a ruck sack or back pack. The weight should be light at first but still challenging. Then add distance and weight over time to continue challenging yourself. Set an ultimate goal for distance and time like 15 miles with heavy pack in 5 hours. Build yourself up to it. It will take time, at first till you reach 5 miles only do it 2 times a week so you don’t over strain yourself. When you reach 10 miles do it 1-2 times a week depending on what you can handle. If you do a major increase in weight or distance than do it only once that week and spend the rest of the week recovering. During recovery do a few shorter distance runs or hikes, do not over strain yourself. Do not restrict water while doing this especially at first. Forget salt tablets, they only sit in your stomach and cause ulcers over time. Your salt intake should be through food so your body can more easily handle and process it. Learn how to take care of your feet: how to handle blisters, proper use of foot powder, boots/shoes that fit correctly, etc… Use the same footwear during your train up that you expect to bug-out in. They most likely need to be broke in and you need to see if they can handle the strain. I agree with most of your plan. I also agree that straight salt tablets are hard on the body, but modern products such as “Camelbak Elixir” or “Nuun” hydration tablets work quite well. I have used them in training and on operations overseas, and under periods of water stress they work to prevent dehydration, and assist in recovery. They are basically salt, but with some flavour, and they break down in water (that is the purpose, you put them IN your water bottle) and are absorbed well by the body. They also have no sugar, so they won’t leave residue over time. Your point about taking care of your feet is very important. Many people will go out and think that a blister is the end of their day. It is not, and with proper bandaging blisters or rubbing sores are quickly forgotten about while on the move. The two important things are- 1. To learn to properly treat blisters and raw skin, and 2. To stop and treat any sore areas BEFORE they become a major problem. If your foot starts to hurt at 2 miles, have the discipline to stop and take of your boots and asses. Sometimes a small bandage or strip of tape will prevent the problem before it really starts. I meant to write “take off your boots and assess”. Don’t try take off your asses, that would probably hurt. I will also mention not to forget your pets. Dogs specifically as your cat likely won’t follow you very well. Although dogs seem as though they always want to run, most dogs that live inside don’t have the endurance for multi-day distance hikes any more than people do. Take your dog out with you when you can, and get them a small pack (many are commercially available for dogs) to carry their own food and water. Also plan for where your dog will sleep (are they going to fit in a tent with you if the temperature drops and it rains?). Spend some time learning how to bandage a paw, or lacerations on a dog’s leg. Working with the angles of a dog’s leg and bandaging fur is more difficult than you think, but resources are available- even ask your vet for a demonstration. Like Wyo.,Steve, I also always carry a cart in my trunk. But, I much prefer to use a portable aluminum golf cart. They have bigger wheels than most luggage carts and are designed for many miles with heavy loads ( bag full of golf clubs). We can always put our packs , and carry the carts over rough spots when needed. Golf carts can be found for cheap, at garage sales & can do a lot of the work on long hikes.